Raiders cornerback Sean Smith was arrested Thursday for a July incident in which he is accused of beating his sister’s boyfriend and stomping on his head in Old Town Pasadena, according to the Los Angeles County District Attorney’s Office. 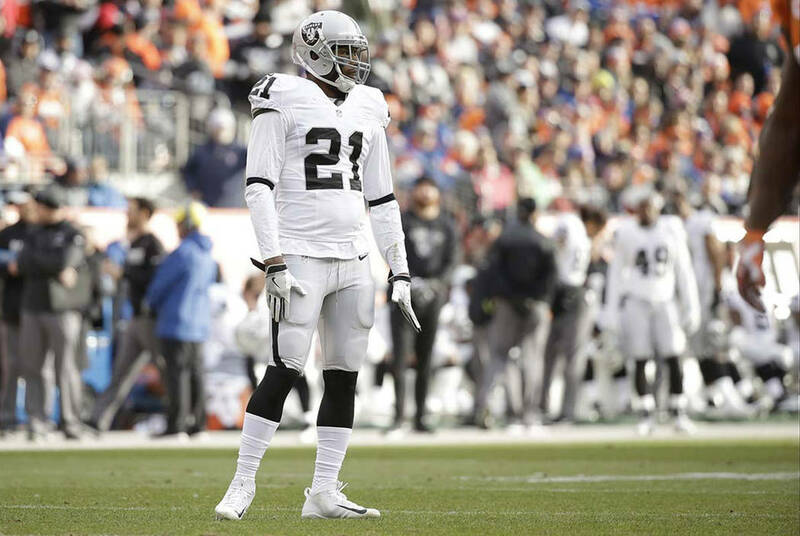 NAPA, Calif. — Raiders cornerback Sean Smith was arrested Thursday for a July incident in which he is accused of beating his sister’s boyfriend and stomping on his head in Old Town Pasadena, prosecutors said. Smith, 30, faces two felony charges for an alleged encounter early on July 4 near the corner of Arroyo Parkway and Colorado Boulevard, the Los Angeles County District Attorney’s Office said. One charge is for assault by means of force likely to produce great bodily injury. The other is for battery with serious bodily injury. His arrest came on the same day the Raiders concluded training camp. If convicted as charged, Smith could serve up to seven years in state prison. Smith was arrested and booked at the Pasadena Police Department, according to a spokesman for the Los Angeles County District Attorney’s Office. He was released after posting $80,000 bail. He is scheduled to be arraigned Sept. 29 in Los Angeles County Superior Court, Pasadena Branch. A Raiders spokesman did not immediately respond to a request for comment. As a Kansas City Chief, Smith missed the first three games of the 2015 season after pleading guilty that year to driving under the influence in June 2014. He failed to provide proof of insurance after his vehicle struck a light pole. His two years’ probation expired this March. Smith is now entering his second season with the Raiders. He considered the first season to be the worst of his career, as he struggled in early games. In Week 8, he tore his shoulder labrum against the Tampa Bay Buccaneers. Still, he finished the season before undergoing surgery in January. This year isn’t looking any better. Smith saw his practice reps fluctuate between the first- and second-team defense during camp. He committed pass interference and illegal contact penalties Saturday in the Raiders’ exhibition opener against the Cardinals. He also nearly ceded a touchdown when biting on a double move in the second quarter; the pass was overthrown. Now, Smith clearly has greater concerns than on the field. The Raiders are slated to pay Smith $9.5 million guaranteed in 2017. Before this, the franchise owned the NFL’s longest streak without a known arrest; running back Kory Sheets was its last in 2014 for speeding and marijuana possession. Smith’s arrest warrant was filed Wednesday, Deputy District Attorney Christopher Stogel said in a release. The Pasadena Police Department is continuing its investigation of the matter. More Raiders: Follow all of our Oakland Raiders-to-Las Vegas coverage online at reviewjournal.com/Raiders and @NFLinVegas onTwitter.